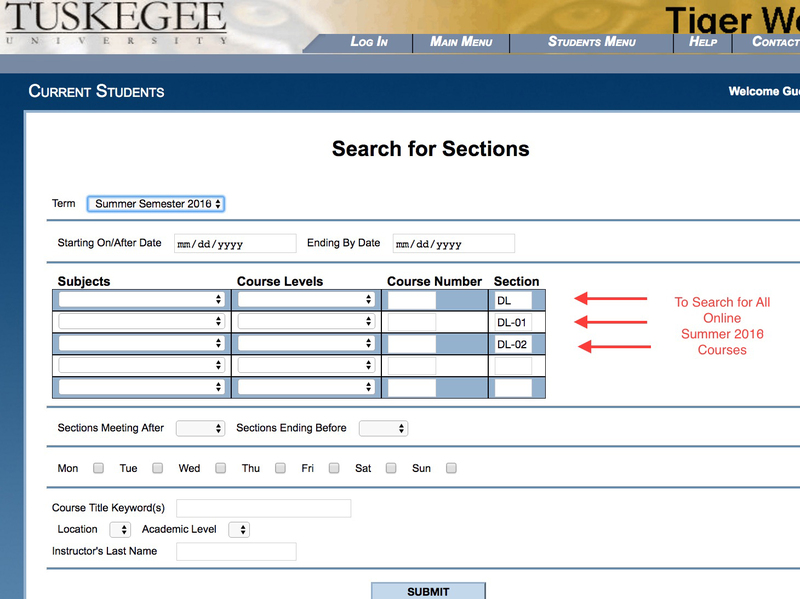 To register for these sections, please log onto www.tuskegee.edu/tigerweb, and search for distance learning sections using the acronym DL in the "Section" box of the Search for Sections screen. After clicking SUBMIT, you will be provided with the list of distance learning courses offered this summer. If you have further questions, feel free to stop by the Office of Distance Education and Online Learning during business hours. *Course list is subject to change. A minimum of 10 students must enroll per course in order for a course to be officially offered for the summer semester. All online courses are semester-based and operate much like a typical Tuskegee University course, except delivery will be online. Courses will be taught by Tuskegee University faculty and instructors. Course(s) can be used toward Degree requirements (including Free Electives). IMPORTANT: Ask your Academic Advisor to recommend Online course(s) that will count towards your Degree requirement before registering. Tuition and fees will be posted via the Bursar's website and will include all Tuskegee University fees as applicable. Some mandatory fees will apply to these courses; please see the Bursar’s website at www.tuskegee.edu/onestop for detailed information. Online summer courses taken at Tuskegee University are used in computing the GPA. You must also have high-speed Internet access and are required to follow specific technical requirements. Course delivery will be facilitated through Blackboard distance learning technology – Tuskegee’s learning management system. You are expected to have general experience in computer applications such as word processing, spreadsheets, database, Internet research, media presentations, and email communication.